Welcome to our guide on creative ways for patio decorating on a budget. Creating an outdoor oasis doesn’t have to break the bank, in fact in some cases in the long run it can earn money. We’ve all heard the saying “you’ve got to spend money to make money”, and in this case it can mean a return on investment if you decide to sell the home. Designing an outdoor space will also pay dividends by providing a place to spend time outdoors and less energy usage by not turning on as many lights, or cranking up the AC as often throughout the day. 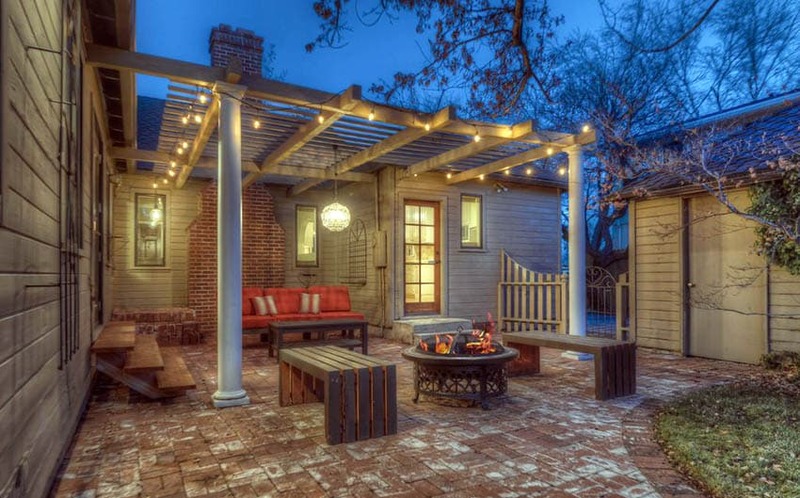 Plus adding an outdoor space will create a great spot for entertaining and increase the home’s overall appeal. 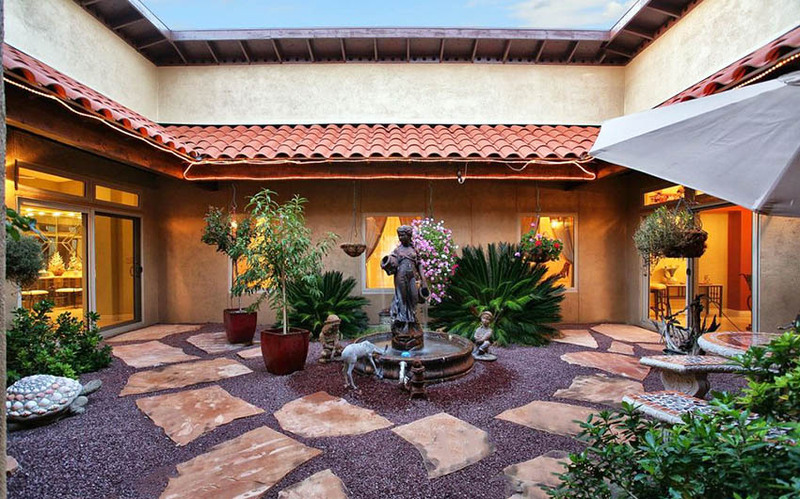 Here are some of the best ways to decorate a patio on a low budget. The beautiful backyard patio above was created using both concrete and brick pavers for an inviting design. A simple wood canopy with climbing vines is an attractive an low cost way to provide shade and tranquility. Choosing the material of the patio will be a big make or break on the bank. Hardscaping is typically the most expensive part of the backyard project. Consider using materials that are on the lower budget end such as gravel, or crushed rock. If that’s not the intended look pavers or traditional stone can still be viable options. You can view more gravel patio ideas on this page. Look at local landscaping and outdoor stores for stone leftovers, or even larger pieces of stone that can be put farther apart to create less need for material. 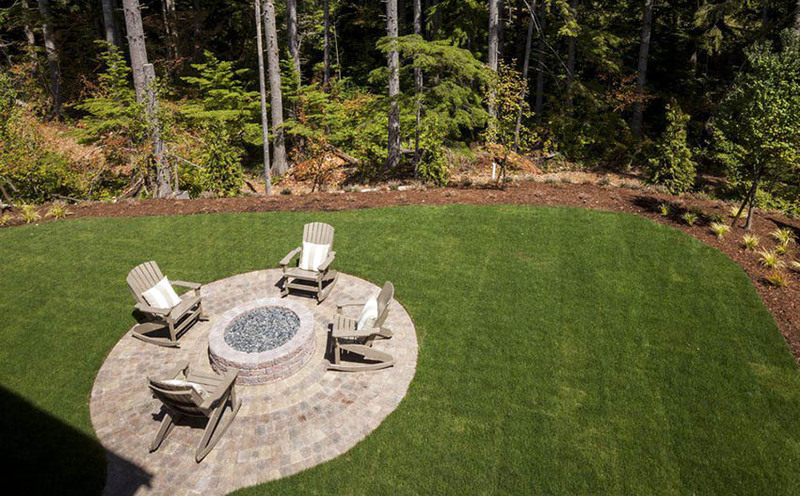 Keeping grass or crushed stone in as much area as possible will save on material purchase as well as create a softer feel to the patio and backyard area. Check out our gallery of stone patio designs here. 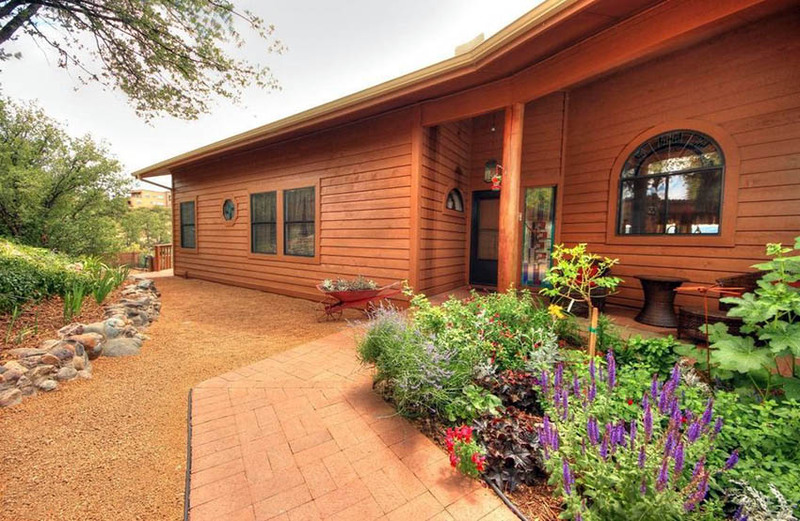 This home features a paver walkway leading to a porch patio. Flowering plants make a bright first impression and an antique wheelbarrow makes for a great flower planter. See more wheelbarrow planters here. 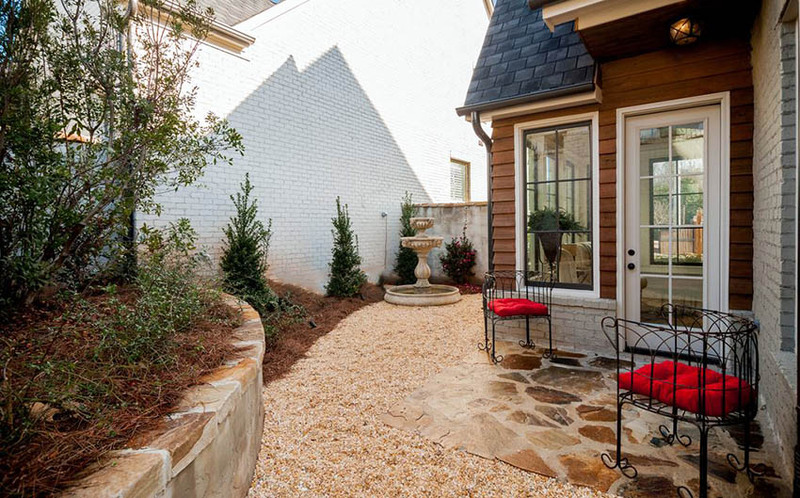 An inviting backyard patio can be created using relatively inexpensive brick or irregular pavers. Another alternative are more expensive bluestone pavers. Check your local landscaping store for special deals which can save you money when buying by the pallet. 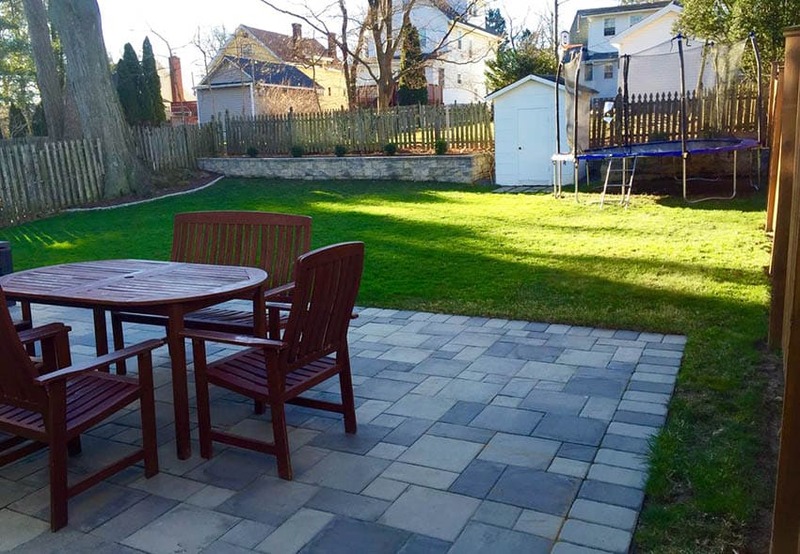 The picture above features a DIY paver patio with custom brick fire pit surrounded by lawn. Wood Adirondack chairs provide a restful place to lounge and enjoy the beautiful outdoor setting. This would make an ideal place for night time entertaining with friends and family. 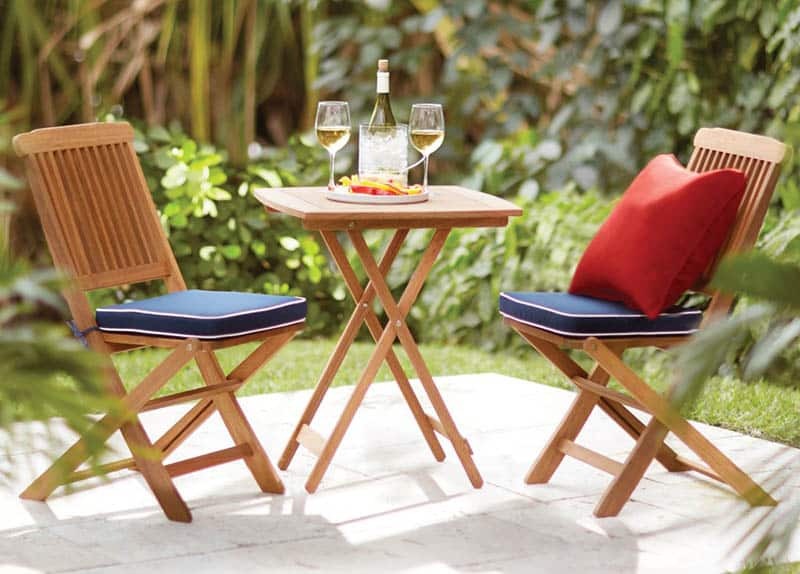 Choosing outdoor furniture can be quite daunting, especially when looking at price tags. 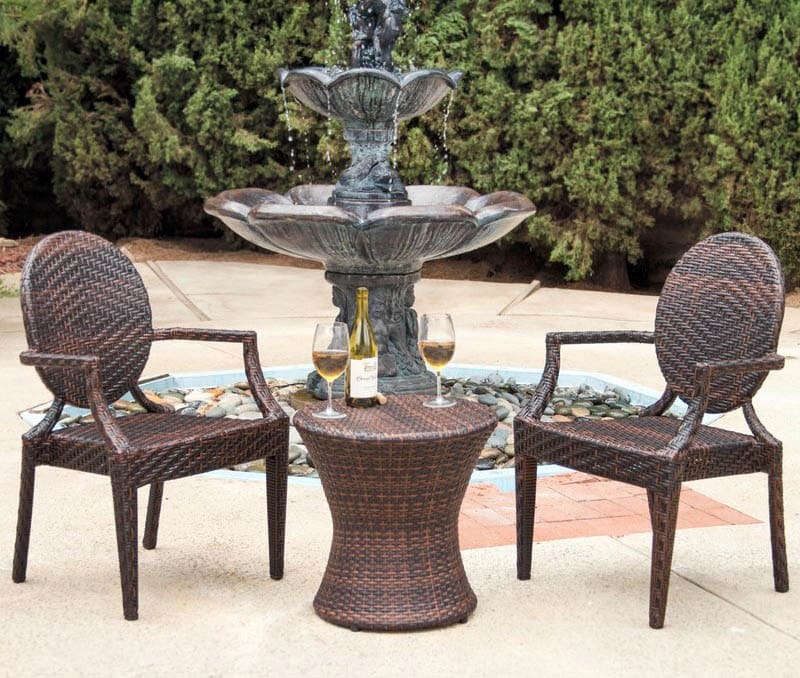 Outdoor furniture needs to be extremely durable to withstand the elements. When buying furniture for the outdoors one should look for wood like teak, cedar, or eucalyptus. These natural materials are better suited for the weather. Plastics, wicker, aluminum, steel, and wrought iron as well and most synthetic materials are also good options for outdoor furniture. Synthetic wicker made from polyurethane holds up well in an outdoor environment and can be found a great prices. Another important thought when picking the pieces for an outdoor space is that if in a rainy area, things that are easily movable, or even have wheels, could be a very good option. Bar carts can add a great touch while still being able to transport items from indoors to outdoors. Now that the proper materials are out in the open, we need to figure out where to get these things. Some would go to the nearest target and pick up whatever they have on display. While this is a very easy solution and can turn out wonderful, it is not quite cost effective. Put the DIY boots on because it’s time to get creative. This custom DIY block bench is constructed out of inexpensive pavers and topped with a vinyl cushion. 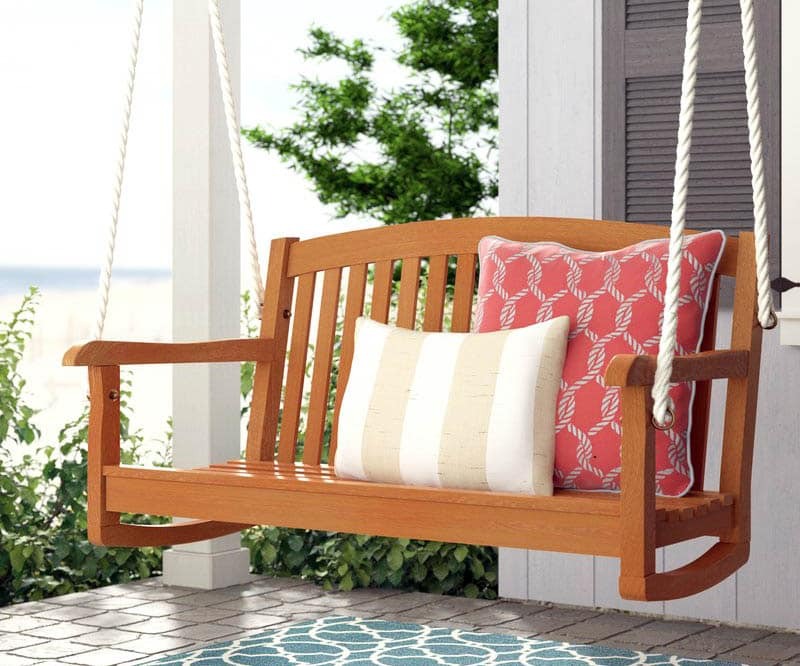 In some situations, there’s not even need to buy an item, as a seat could be built out of extra materials leftover from building the deck or patio itself. Adding built in seating will add a high class look with a low budget. If items are needed though there are so many great furniture pieces that are just collecting dust in people homes. 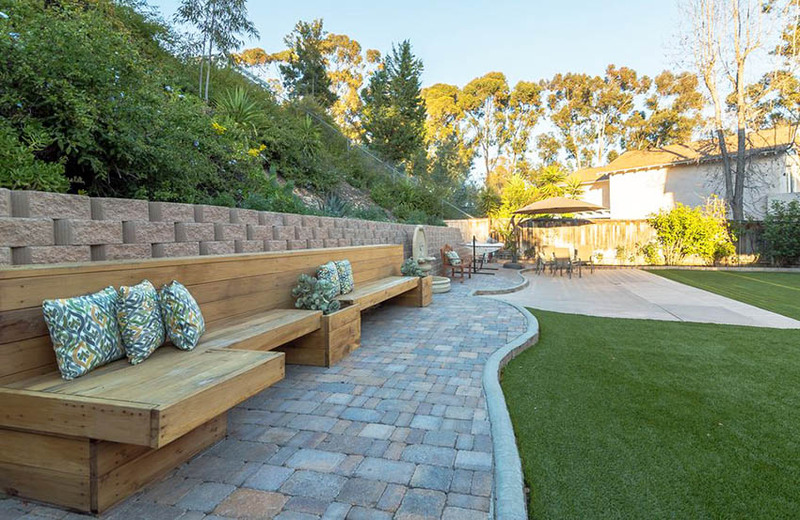 This backyard paver patio walkway features a custom wood bench with built-in garden planters. 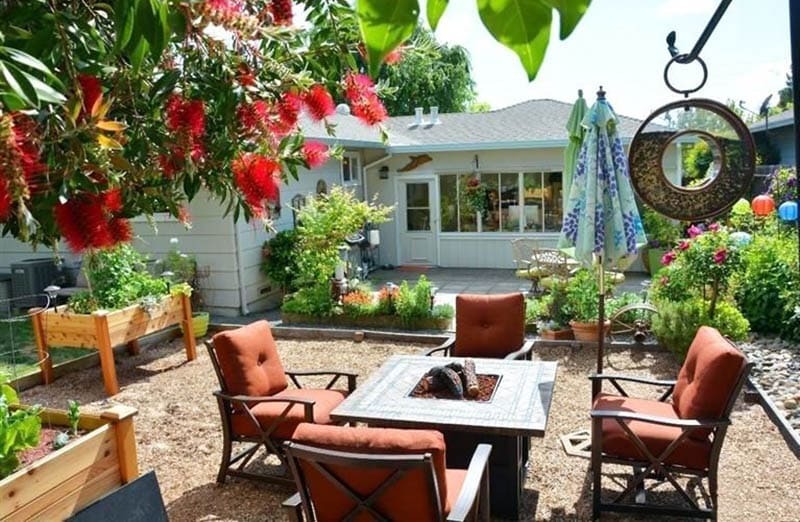 A small concrete patio provides extra space for outdoor dining. When people are ready to let others have their hidden treasure they’ll sell them in a variety of places. You can find great deals for patio decorating on a budget at garage sales, facebook groups, consignment shops, antique shops, and online apps. Popular online sites to find great deals include varage sale, offerup, shopck, ebay, craigslist, anywhere they can find someone who will take this piece out of their home. Even if a piece doesn’t give that love at first sight feel, it will once the DIY process begins, metal and plastic are easily painted, and any fabric is easily replaced or cleaned for a completely unique piece. Furniture isn’t the only thing that makes a space special, and not the only thing that can easily cost an arm and a leg. Outdoor Décor is something that can easily rack up the Benjamins. Adding planters, lighting and accessories is an important part of creating an inviting space. This doesn’t mean one needs to walk into pier one imports and drop their purse, there are easy and fun DIY tricks to help stick to the budget. Try buying seeds and planting a vegetable garden, seeds are extremely inexpensive and will make up for it on the grocery bill when you have fresh vegetables! Painting rocks found in the yard is another basically free form of decoration. Find some old vases, or jars from the house and fill them with the painted rocks! Or even fill them with fresh picked flowers, another self-sufficient part of the newfound backyard area. This garden patio is created using crushed gravel with DIY wood garden planters and a portable fire pit. Back toward the house the patio is constructed of inexpensive pavers. Stepping stones can be a great family project and are inexpensive accessories to add to the garden and flowerbed or used to create a path through the patio and backyard. Even a bowl of fruit can spice up the space, once the creativity starts rolling, the wallet starts singing. 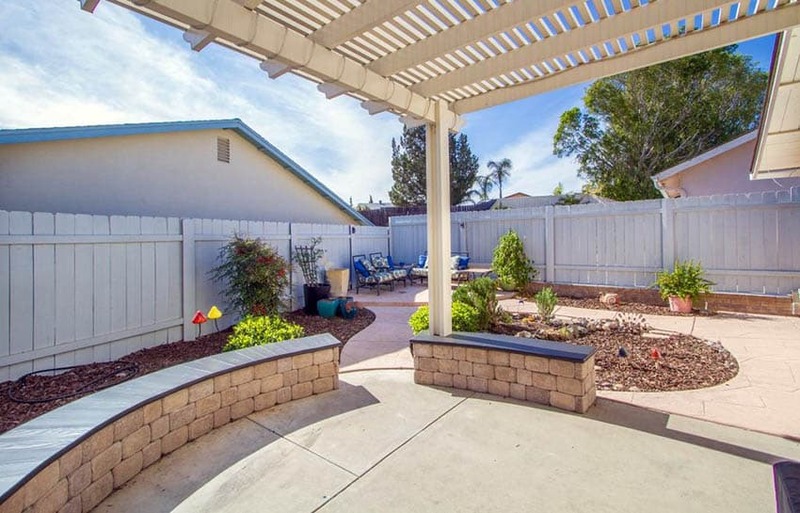 This is another place that yard sales and yard sale sites can come in handy for creating a unique inviting outdoor space. If buying items, always check for clearance (buying outdoor furniture in the winter will always get the best deal). Sometimes people think that having one entire set of furniture is necessary, but mixing and matching is completely acceptable, especially because then there will be no other space just like it, and everything will be uniquely the owner’s personality. Repurposing and reusing items and materials is a great way to save money on any project. The possibilities are endless, whether its making a hutch out of old scrap wood, or filling last of a set bowls with water, rocks, or flowers. 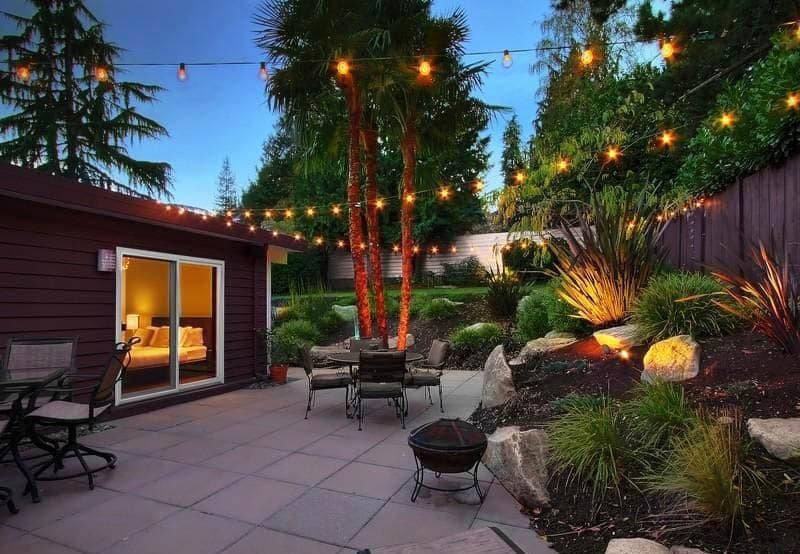 Adding string lights to a patio can create a magical, inviting area with very little cost, just make sure there is an outlet nearby. Adding furniture and accessories is all fun and games, until one realizes they forgot about the most important part of a patio area, the nature. This can actually be one of the most budget friendly aspects of the project but could possibly require some upkeep. 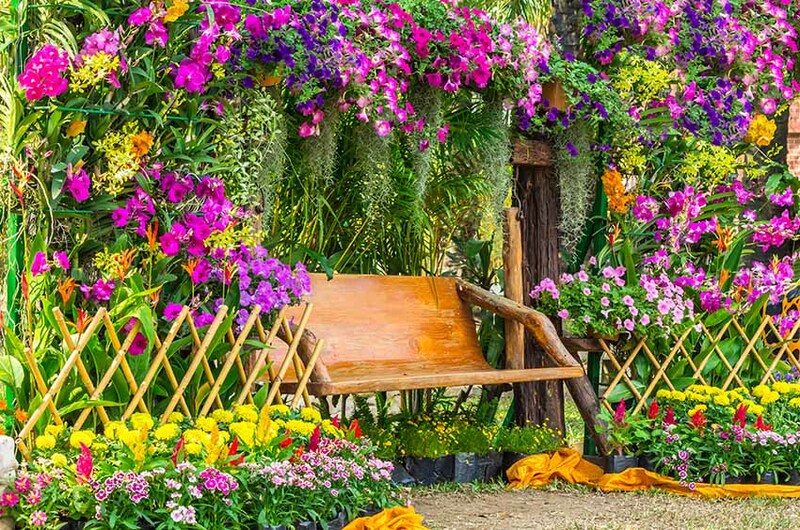 Ask friends and family is they have any overpopulation of flowers that could spare a few to be transferred to a new home or stop at the nearest garden store for some inexpensive seeds or potted plants. A pergola kit is an affordable way to bring needed shade and ambiance to your backyard patio. 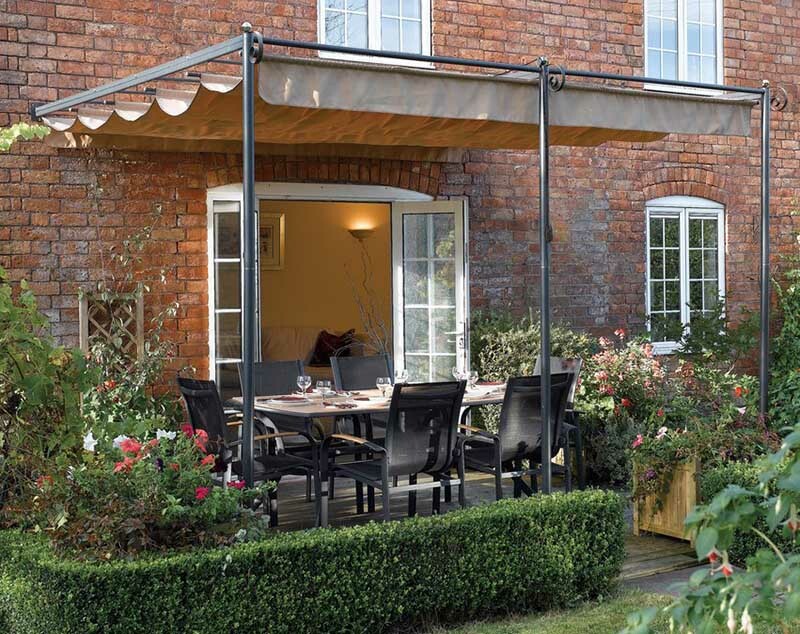 A canopy top can be used to create an outdoor dining area that’s perfect for entertaining. See more pergola pictures on this gallery page. As mentioned before creating a veggie garden can even be a double money saving hack. Plus, they are beautiful to look at while enjoying the new patio. 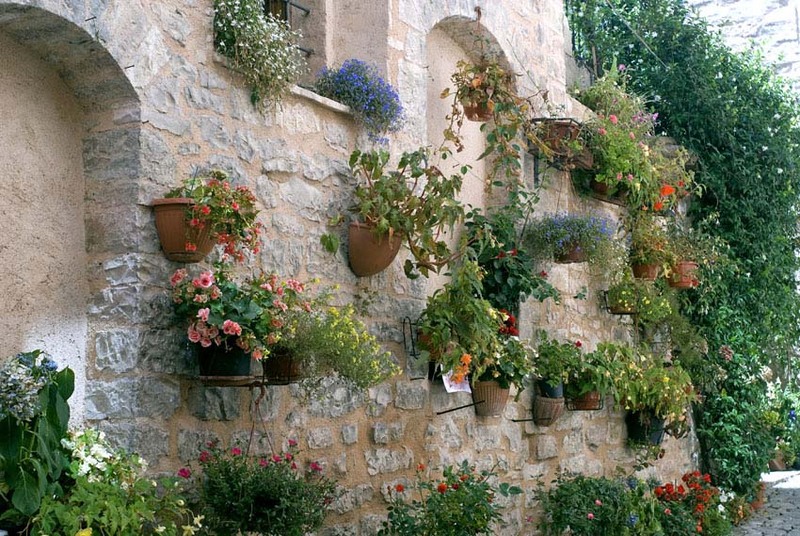 Another ideas for patio decorating on a budget can be vertical gardening, this can double function as natural greens spaces and wall décor that will be safe to withstand the outdoor elements. Get more vertical garden ideas on our gallery page.